@ A.E. Harris is run by Stan's Cafe. In addition to providing the company with the ability to develop and present their own work it is there to HELP MAKE THINGS HAPPEN. If there is something you want to MAKE HAPPEN then maybe @ A.E. Harris can HELP. 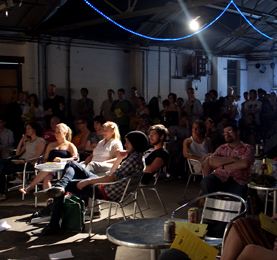 The venue's priorities are in supporting live performance and particularly theatre work. The venue is keen to help make things happen that couldn't happen elsewhere. The program is intended to be a mixture of public presentations with developmental work. There are opportunties to rehearse or run workshops or conferences at the venue. Stan's Cafe currently receive a subsidy from Arts Council England to help the venue survive. Whilst there remains a pressure for the space to generate an income to cover its running costs ACE support does allow a number of projects to happen each year for which hire fees for the venue are significantly below cost price. If you are interested in hiring @ A.E. Harris to help make your thing happen then please get in touch. @ A.E. Harris has regular need for people to work as fire marshals, on box office, behind the bar or as production assistants. Some projects have finances to have these as paid jobs, others need to be undertaken on a volunteer or barter basis. If this sounds like the kind of thing you would be keen to do then please do get in touch.